Everything about our grand trip to the Eastern Hemisphere is an adventure. I mean, it’s not every day you leave a comfortable home and a good job to go wandering around the world. 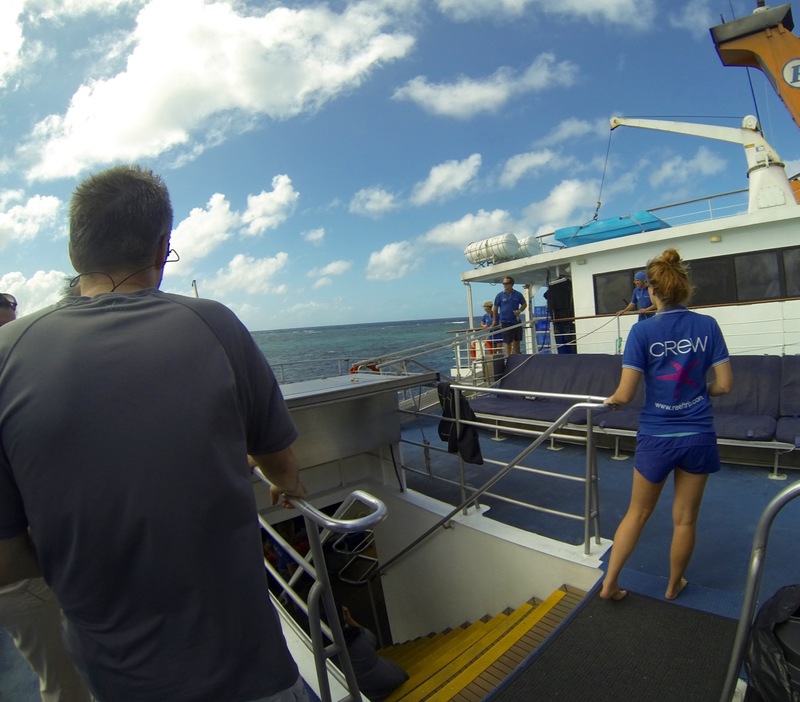 But our trip to the Great Barrier Reef was the first part of our journey that really felt like an adventure. Until then we’d been mainly sightseeing and getting used to living in a foreign country. 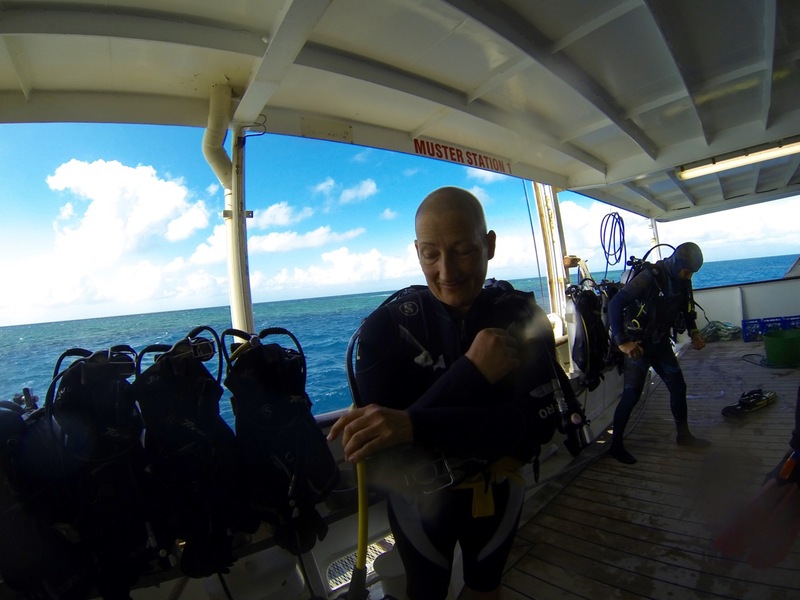 But September 13, 2015 was the first day of our two day live-aboard dive cruise on the Reef Encounter. We’d never done a live-aboard before, and had only dived on day trips from the shore, which are a lot less expensive. But since we may only get to the Great Barrier Reef once, we decided to splurge. Besides, with the exchange rate in our favor, doing a liveaboard in Australia is a lot easier financially than in America. The trip actually started Saturday night, in some regard. We could only take a small overnight bag onto the boat with us. Our little cabin on the boat wouldn’t hold my giant yellow suitcase anyhow. So the trip started with us packing only the minimum into our little day packs, and then dragging our suitcases about 3/4 of a mile through town to the dive company office. Fortunately they stay open until 9pm. Sunday morning, we got up early and with only a minimum of prep walked down to the wharf where we checked in for the boat ride. This dive operation has an interesting approach. They have one smaller boat called Reef Experience that goes back and forth from the Cairns wharf to the reef every day. People who sign up for a day trip just stay on that boat, but the people who are staying overnight at the live-aboard use that first boat as a transfer. That way the bigger boat, Reef Encounter, can just stay on the reef all day and all night, and passengers — and even the captain and crew — are ferried on and off. That allows them the flexibility to offer overnight live-aboard experiences for any number of days. We just signed up for one night, but other people we were there with were doing two or three or even four nights. As an aside, the bigger boat with the cabins has a big crew, as you can imagine. There’s the captain, who doubles as mechanic, I guess. But then there are nearly a dozen other staff members who are dive instructors, dive leaders, cooks, etc. And a couple of the people are essentially interns. In exchange for washing dishes, they get to dive for free. But back to my story. Beth was diving, but due to my ear problems I can only snorkel anymore. There are three locations this company dives. They are, from north to south, Norman Reef, Saxon Reef, and Hastings Reef. The first two stops of the day were at the middle location. The first session was just to get our feet wet, no pun intended. Beth and I both snorkeled around, got used to swimming in the ocean again, etc. There were a lot of fish, but no huge ones. For the second session of the day, Beth dived with the diving group and I snorkeled, using a “noodle” for extra buoyancy. After that, the crew moved the boat while we rested. Our third session was then at a place they call “Playground” in the Norman Reef. The boat was parked far enough away from the fingers of the reef that we had to swim a ways over a deep sandy bottom to get to anything that was interesting. But while I was swimming over there, I did see a shark on the bottom. I couldn’t tell you what kind of shark, since it was about 10 meters below me and the visibility wasn’t great. Plus, what do I know about shark species? Once I got to the coral areas, I found it had lots of fish, and more interesting the fish were bigger. 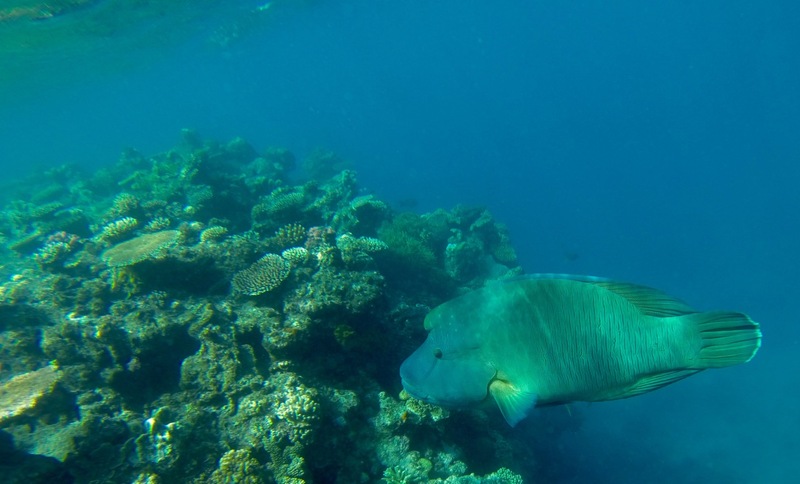 I saw some one surprisingly big parrotfish. I’ve gotta talk about what a luxurious diving experience this was. I don’t mean “luxurious” compared to staying in a fancy hotel where everything’s clean and nice, but luxurious as far as diving goes. Having your own personal stateroom, even if it’s small, is nice. After a dive, we could take off our gear and stow it outside, then come into our private bathroom and enjoy a (quick) warm shower to get the salt water off. The interior of the dive boat was air conditioned, too, which made it feel very nice (and probably reduces the chances of seasickness on warm days in rolling seas). Plus, we didn’t have to worry about where to go for dinner, because the cooks were making hot meals and snacks for us, only about 50 feet from the dive platform and 50 feet from our beds. 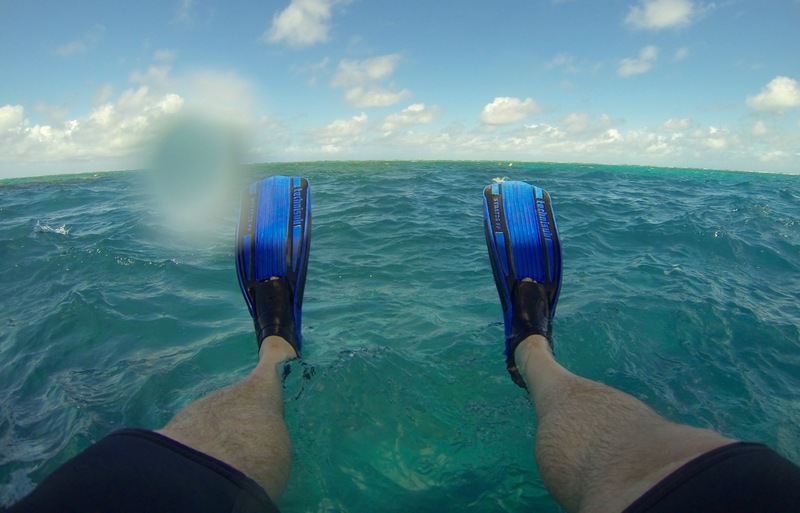 The liveaboard boat is heavily used because of the non-stop stream of divers and snorkelers coming and going, but the experience and service were great. That night I slept on a boat for the first time. It was windy, and so the boat rocked some. I didn’t sleep all that well. But it was reasonably comfortable, and when I couldn’t sleep I went topside to look at the stars for as long as I could stand the cold wind, which wasn’t really all that long. The boat’s running lights stay on all night, and they attract tons of fish in the dark. Day two could have started with an insanely early “water session” but we decided to sleep in a little. 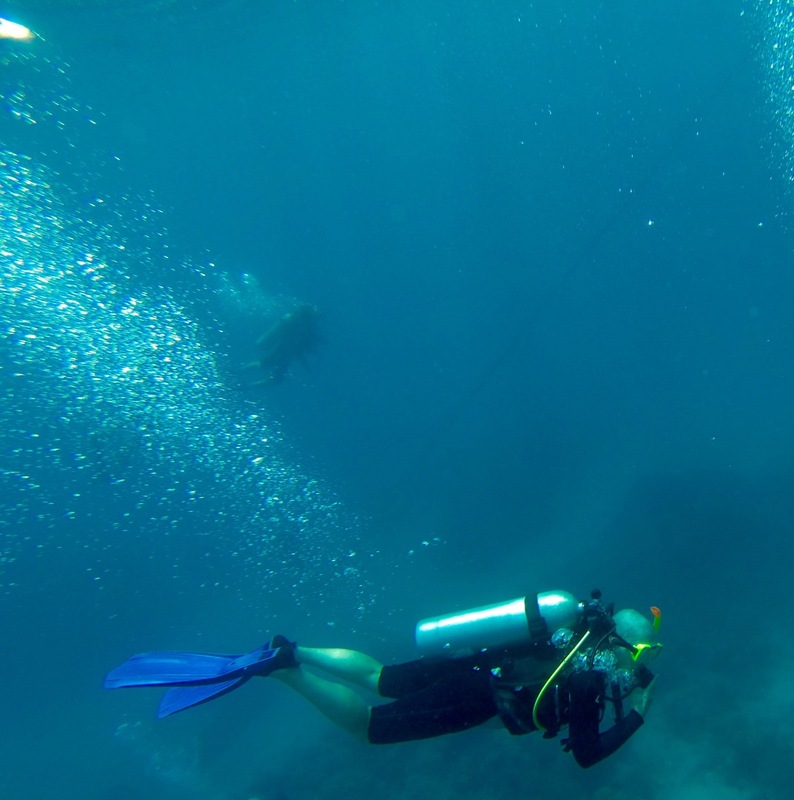 We had three more dive/snorkel sessions that day, with hot meals and snacks and warm showers in between. 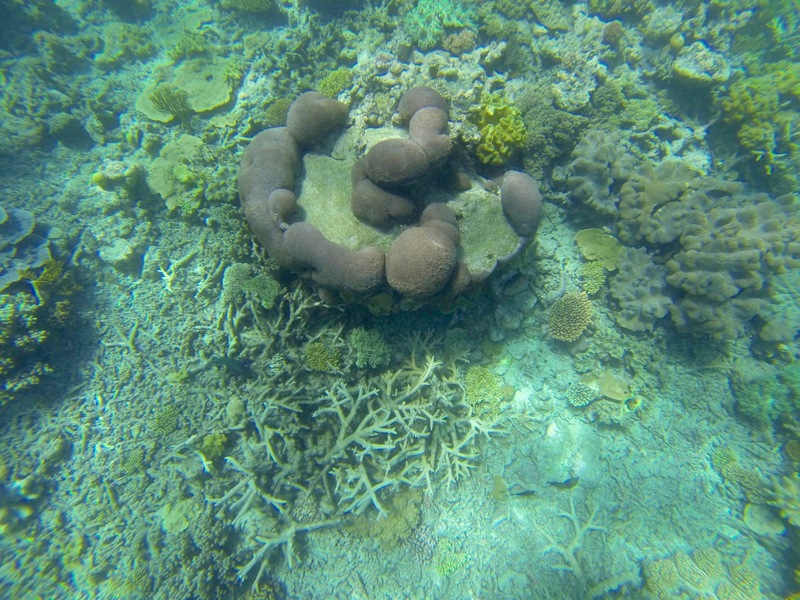 Then we transferred back onto the Reef Experience, and took a very bumpy trip back to shore. After only a couple days at sea, I felt like my body was still swaying with the ocean as I walked around, and also when I went to bed that night. The next day, I felt a lot more stable. I don’t know if this happens to everyone, or if it’s just a side-effect of my slightly wonky inner ears. Beth and I talked about the experience later. We both had fun, but neither of us is anxious to rush right back and do more snorkeling and diving. We’ll have a couple opportunities later in our journey, but I don’t know if we’ll take them. If you want to see more photos of our dive trip, I created a Flickr photo album of the 74 best shots (out of about 650) that I took with my GoPro. Check it out right here. In this case, the shark looked to be sleeping.